True fire roasting over an open flame brings out the mouth-watering taste of La Victoria Chiles. 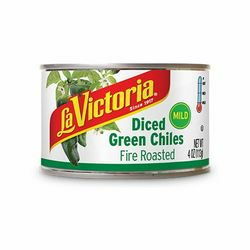 Great for Chiles Rellenos. No water is added, so you will only get the full flavor of savory Chiles. Chilaca o Chile Anaheim es suave de picor y muy sabroso para preparar omelets de huevo y con queso fundido. Chiles en cuadritos.